With overwhelming bipartisan support, the United States House of Representatives on Wednesday passed a massive $636 billion military appropriations bill for 2010. The bill includes some $128 billion for the wars in Iraq and Afghanistan, but it does not fully fund the Obama administration’s escalation in Afghanistan, making likely further appropriations for war spending next year. The deployment of 30,000 additional US troops is expected to cost $35 to $40 billion a year. On Wednesday, the Pentagon announced that the first of the new troops ordered to Afghanistan have begun to arrive. 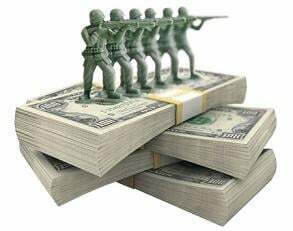 All told, US military spending in 2010 will be close to $700 billion. If one adds the hundreds of billions of dollars in military-related spending included in the budgets of other departments, the total is as much as $1 trillion. The overwhelming support for the bill, which passed 395-34, demonstrates the bipartisan agreement in Washington on the war policy of the Obama administration. The vote comes shortly after President Barack Obama’s Nobel Prize speech, in which he outlined an expansion of US militarism. Among the many separate provisions of the bill is the allocation of $80 million to acquire more unmanned Predator drones, currently being used to bomb both Afghanistan and Pakistan. The administration is planning on expanding these operations, including drone attacks against insurgents in the Pakistani province of Baluchistan that might target the large city of Quetta. Only 23 Democrats voted against the bill, joined by 11 Republicans. Among those voting for the measure was House Appropriations Committee Chairman David Obey (Democrat, Wisconsin), who has postured as a critic of the Afghan escalation. The Senate, which is currently discussing Obama’s health care overhaul, is expected to vote in support of the measure later this week. Added on to the bill was a two-month extension of the anti-democratic Patriot Act, which also has bipartisan support. Other amendments to the bill temporarily extended jobless pay and health care assistance for the unemployed. These measures will be reexamined in February. The House did not include a measure that would extend the estate tax, which applies only to the wealthiest layers of the population. The tax is due to expire next year as part of Bush’s tax cuts. The House leadership also decided to exclude from the military appropriations bill a separate “jobs” measure. This $174 billion bill—including a six-month extension of unemployment coverage, limited aid to states to cover Medicaid costs, and $27.5 billion in highway construction and repair projects—passed by a vote of 217-212. By segregating the two bills, the Democratic House leadership allowed the Senate to pass the military appropriations while delaying consideration of the meager economic relief package. After authorizing the military spending by a wide margin, both the Democrats and Republicans made clear that they are planning for a year of fiscal austerity, in which non-military spending programs will be targeted. Obama is set to launch his campaign for cost-cutting in his State of the Union speech in January. Separately, by a vote of 218-214, the House passed a short-term $290 billion increase in the federal debt ceiling, raising it from $12.1 trillion to about $12.4 trillion. The Obama administration has warned that it might run up against the current limit by the end of the year. Republicans and some Democrats resisted a proposal to lift the debt ceiling by $2 trillion. “Representative John S. Tanner, Democrat of Tennessee and a leader of the fiscally conservative Blue Dog Coalition, said the short-term increase in the debt limit amounted to Congress’s ‘hitting the pause button’ while allowing lawmakers time to work out a way to tackle the deficit,” the New York Times wrote. Meanwhile, states, cities and school districts throughout the country are imposing cuts to balance budget deficits that add up to a small fraction of the military spending bill. • $550 million in K-12 education cuts in Michigan, leading school districts to lay off staff, close schools and eliminate programs. • $300 million in cuts to K-12 education in Indiana. This amounts to an across-the-board 3-percent cut in the state’s education budget. • $101.5 million less for public schools in South Carolina, adding to cuts of $85 million in September, along with $38.3 million in Medicaid cuts. • $110 million in cuts to the 127,000-student Prince George County School District in Maryland, including 490 layoffs, an increase in class sizes, and teacher furloughs. • $750 million withheld from local governments by New York Governor David Paterson, including funding cuts of between 10 percent and 30 percent for school districts. • Plans for up to $470 million in cuts to public education in Los Angeles, California, including up to 8,000 layoffs. The combined budget deficits for all 50 states this year was about $180 billion, less than one third of the military appropriation passed by the House.